Everything came together rather fast in 2006, because we acquired the bulk of our animals in one month. We received two llamas at that time, Sparky, and Thunder, from a friend who bred llamas, but had too many males. They gave them to us for free. It wasn't long before we noticed the sheer difference in their personalities. Thunder was very mellow and reserved, loved having his cheeks rubbed, and didn't do anything to inconvenience anyone. Sparky, however, is a pistol. He is flighty, suspicious, rude, and tries his hardest to do the complete opposite of what you want. Sparky also despises being touched and only likes you when you happen to have food with you. In the wild, Thunder would have died as a cria, because he was just so lazy and unwilling to do anything that he never would have lasted. Sparky would fight with every male llama around and amass an extensive harem in short order. While Thunder had a cute llama face, Sparky looks like a jerk. However, we underestimated Sparky. They had grown up together, being born only one month apart, and they genuinely liked being together. Sparky would freak out if separated from Thunder. Though, neither of them had been gelded and testosterone flooded Sparky's system. Over time, and to our shame, Sparky killed Thunder. We didn't know male llamas fighting habits at the time. We were unable to realize why Thunder continued to decline. Thunder is buried about twenty yards from the barn. Sparky was gelded by the vet in November of 2008. He continues to be a jerk. If you read the paragraphs above, then you know Sparky. 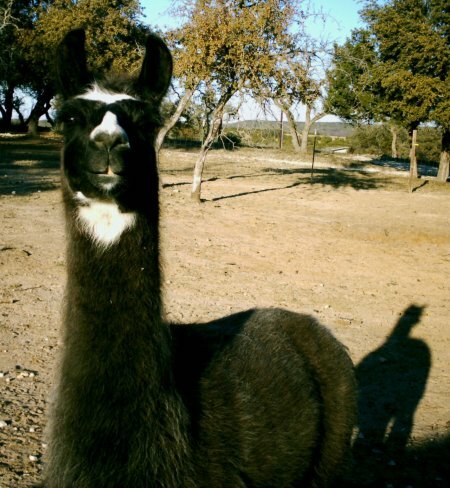 One word sums up this llama. Jerk. Even his mother was a jerk. He comes from a long line of jerks. He makes an excellent guard llama though.